Non-refundable rate applies for all group reservations. All group reservations must be first accepted by the management, reservations are not confirmed unless they are conformed by the management of the hostel directly. Soul Kitchen belongs to the new generation of hostels, it features ensuite private rooms, custom bunk beds with curtains for privacy and cool design. It’s perfect for solo travelers, couples and families. 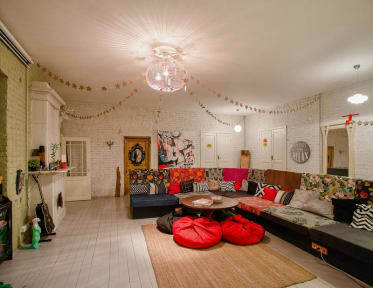 Soul Kitchen hostel been included in top 10 Luxury Hostels in Europe by The Guardian. And it has won the prize of the Best Design Hotel at the Russian Hospitality Awards 2017. The owners of Soul Kitchen Junior are passionate hosteliers who took their time to conceptualize and build the hostel from bottom-up. Their goals are to get together the privacy of a hotel with youth hostel social vibe as well as carefully decorated interior design. Soul Kitchen hostel is ideally located in the most beautiful and central area of St Petersburg (near St Isaac's cathedral) in 150 years old Neo-baroc building on Moika river embankment, within a short walking distance to all major attractions and interesting spots of the city. Our guests are welcome to relax in our spacious TV lounge, surf internet or read a book in the reading lounge and enjoy the fantastic river view from the balcony. Take advantage of our unique kitchen, equipped with everything needed to cook a good meal and with the authentic stove of 19th century that we've upgraded to the modern gas oven. Our facilities include 4 shared and 10 private bathrooms, three common rooms (two lounge rooms and kitchen with dining area), deposit lockers for your huge backpack, free towels, linen, free coffee and tea all day, free wi-fi and even free international landlines calls for 56 countries. All bunk beds are equipped with privacy curtains, power sockets and reading light. You can also charge your gadgets and accessories safely with power socket inside the individual lockers. To help you getting around we've got free maps, our staff will help you to find activities for your interests, as well as recommend hidden treasures. We can also help you with booking of your train ticket. After you check out you can leave your luggage with us for the day, free of charge. We offer tourist voucher and invitation for your Russian visa and by the way, you can stay in St Petersburg without visa when you travel with a ferry, check out our website for more info. Maximum stay is 14 nights and minimum 2 nights. Kids under 2 years can stay for free (we can provide a baby cot and a child chair for your request). We have no age restriction for private rooms, but we don’t accept kids under 16 years old in dorm rooms. There is no availability for Soul Kitchen on your selected dates. AMAZING hostel. Really loved my stay there. Everyone who are visiting St. Petersburg should stay there as a part of the fantastic-St. Petersburg-journey. Terrific Hostel - one of the very best I ve stayed in. Girls were all so sweet. Great staff, always offering help and available for any questions or doubts. Good location near the main atractions. DO NOT STAY AT THIS HOSTEL I don't care if it's your first time or millionth time in a hostel, if you want to keep any shred of desire to stay in hostels after, don't stay here. This hostel is so extraordinarily spectacular it will ruin every other hostel for you. The only thing better than this hostel are two of it's staff: Anastasia and Natasha. To put it simply: they are both amazing and brilliant. Fantastic hostel, with the hostel being such a high score, expectations are enormous. They surpassed every expectation I had the cleaners are incredible and work ridiculously hard. My only issue was that the laundry is 500 Rubles roughly about $6 so do your laundry else where. The best hostel we’ve ever stayed at! The staff is unbelievably helpful, the rooms as clean as you can only imagine and they offer everything you need. They offer cooking classes for free every single evening. You also get freshly cooked coffee and tee all the time and there are many other special items like slippers you can color, shoe warmers, hair straighteners etc. The hostel is located right between numerous restaurants and cafes and just some walking minutes from the main sights.